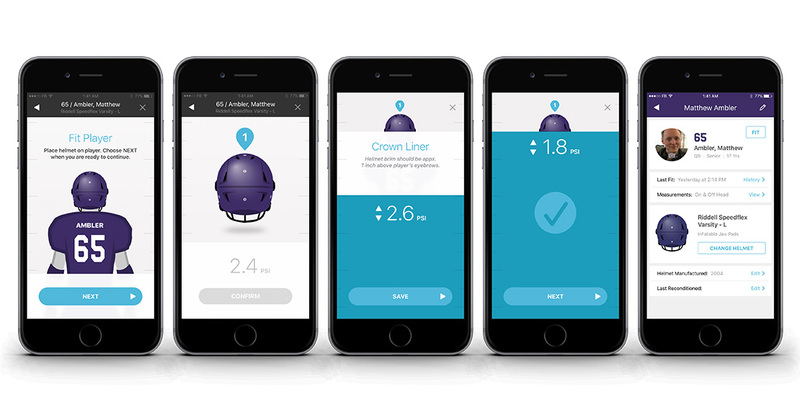 With an app-controlled handheld electric pump, HelmetFit eliminates the guesswork of the helmet inflation process and establishes a custom fit for every player. 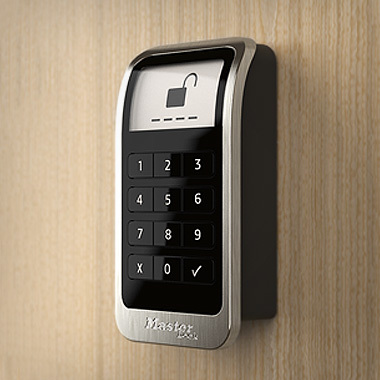 Bresslergroup called on all its disciplines to create an intuitive digital-physical user experience that solves a package of unique problems. HelmetFit’s founder, Mike Weatherby, was sitting out a quarter of his senior season of college football due to a head injury when he got the idea to innovate the helmet inflation pump. A properly fitting helmet is the first step in player protection, and the old-fashioned hand pumps still in use from when he was playing in youth leagues were not cutting it. Air bladders have long been used inside football helmets to customize fit around a player’s head. Equipment managers typically use hand pumps to inflate the bladders, accessing them via ports on the helmet’s exterior for a snug fit. While sitting out his senior football season, Weatherby reflected on how it was always up to the player to request re-inflation, and that it was probably not happening enough. Research showed a clear link between inadequate fit and concussion severity. Stanford researchers had looked at the average G-force data from hits accrued by an NFL lineman during a typical game: 25.8, or roughly what the player would experience from crashing his car into a wall going about 30 m.p.h. Such an impact makes a player’s brain wiggle like a bowl of Jello after a hard shake, and the fibers deep inside his white matter pull and contort. The silver lining of these revelations has been further research and discussions about prevention. The old-fashioned hand pumps still in use from when he was playing in youth leagues were not cutting it. What if design could turn this around? What if he could come up with a better system that would give coaches, equipment managers, athletic trainers, and parents more control over ensuring a properly fitted helmet? Making the helmet inflation process faster, easier, safer, and more precise is a step in that direction. 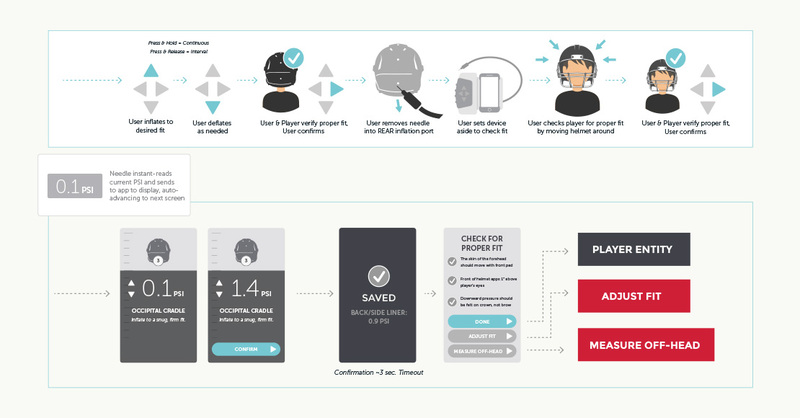 From initial concepts to prototypes, Bresslergroup’s team of user researchers, industrial and interaction designers, and mechanical and electrical engineers worked together to realize a patented football helmet inflation system that measures, records, and maintains a custom fit for every player. The project was complex on many levels, including its interplay between digital and physical elements and its unique constraints. 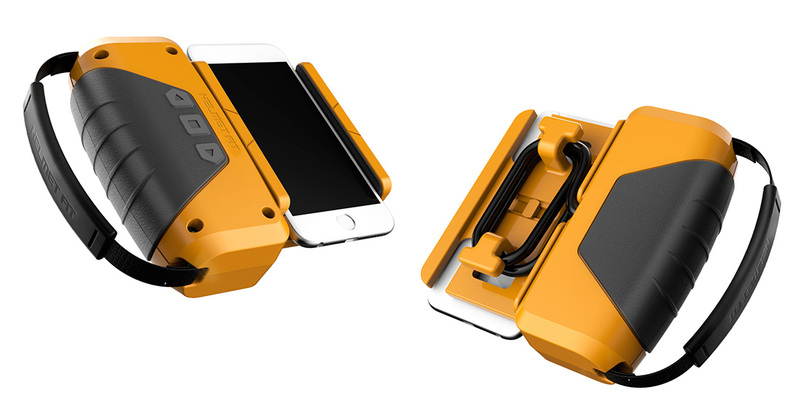 The solution has two components – an electric pump held in one hand (a mobile device clips into it) and an app – that communicate via Bluetooth. Once the parameters of a player’s initial fitting is saved to the app, that data is stored in the cloud to make subsequent fittings faster. The project was complex on many levels, including its interplay between digital and physical elements. Consequently, Bresslergroup’s team came up with the idea for the device to automatically recapture a player’s fit setting, even without the player present. This further increases the likelihood that more players’ air bladders will be correctly inflated and customized to their perfect fit. To start, Bresslergroup’s industrial designers and mechanical engineers explored initial configuration options, solving for how to make the necessary interactions easily accessible during the toughest possible conditions – for example, on-field and pre-game – and within cost constraints. 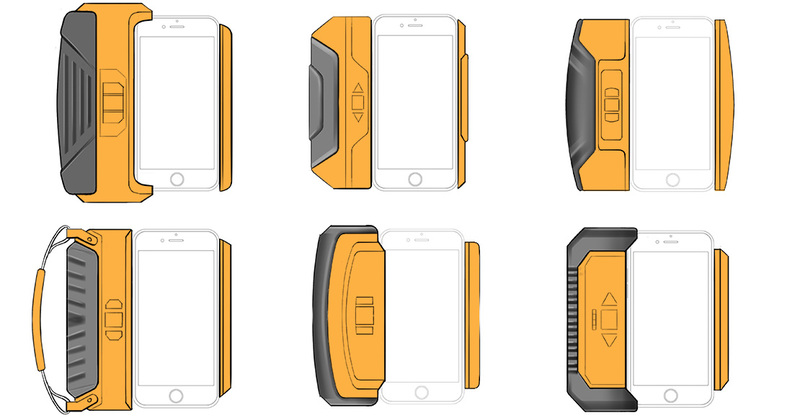 The team narrowed concepts to one that leverages the user’s phone. Connecting to a phone – as opposed to integrating an LED display into the pump – has many advantages. 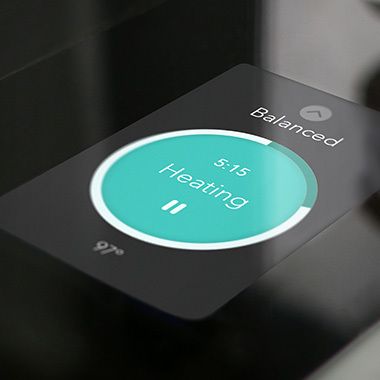 The end user benefits from extensive functionality at a reduced cost when display, connectivity, and input are handled by their mobile device. 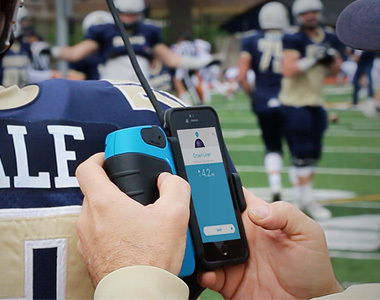 And the many interactions required for set-up — including creating a team roster, entering player info, choosing helmet details, and more — would be difficult without phone capabilities, especially because the device uses cellular versus a WiFi connection while on-field. Leveraging a mobile device also frees up real estate on the pump for a four- way directional pad that makes it possible to step through the process one-handed. (The other hand is busy adjusting the helmet on the player.) The pad’s bulky, tactile controls are usable even for wet, cold, or gloved hands. 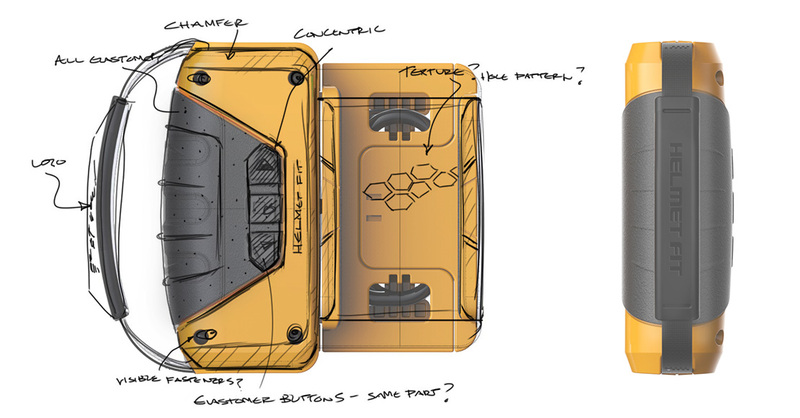 Industrial design refined the concept, designing a pump that combines the design elements of a slick game controller with those of a spring-loaded smartphone car mount. 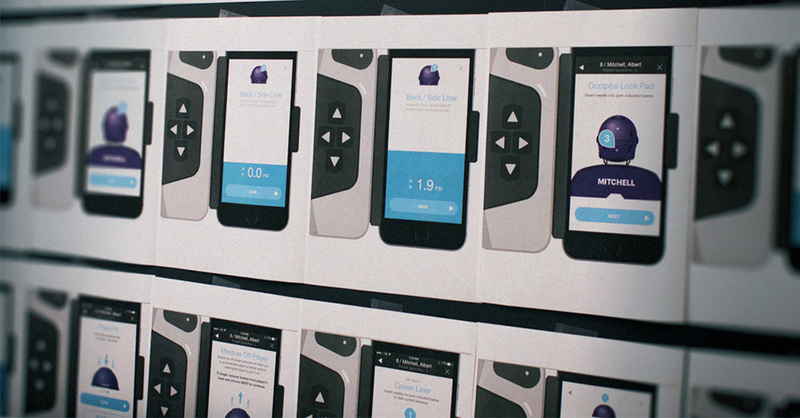 Next, Bresslergroup’s interaction (IxD) designers tackled the system’s unique, combined digital-physical workflow. 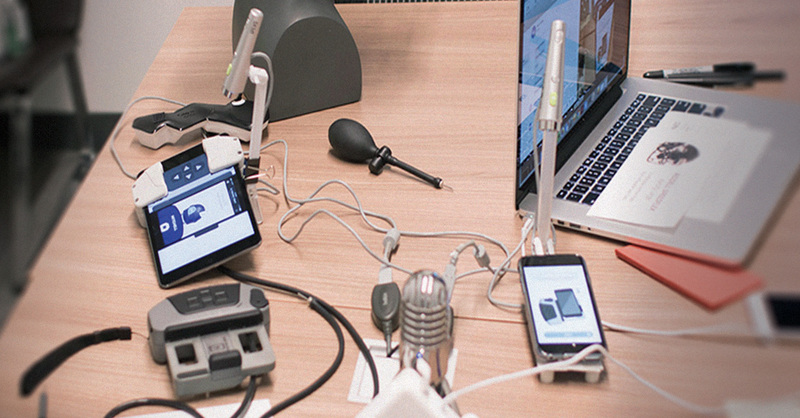 Mapping the digital-physical journey — and iterating along the way as the device and app were tested — was essential for visualizing and clarifying pain points. The workflow deliverable visualizes the physical steps with corresponding digital interactions and back-end elements. The ultimate goal is to determine how the digital user interface can best support physical tasks. Here’s how it works: A player is added to the roster, along with the specific make and model of their helmet. (More than 20 popular helmet models are accounted for.) The database then retrieves the specific bladder configuration for that helmet, and steps the user through the process of doing the initial fit. The PSI of each bladder is then recorded. The mapping led to the creation of two separate interaction types: administrative and functional. The former (pairing device, team setup, player setup, settings) are independent and can be accomplished on the phone without connecting to the pump. These are typical touchscreen interactions, the kind of functions you’d find on any mobile app. For functional interactions dependent on the pump (anything involved with fitting the player), the directional pad has four hard keys (up, down, left, right) that give the user control over the pump and app. “Right” is “select,” to give the user the sense that they’re advancing from left to right through the process. “Up” inflates, and “down” deflates. “Left” is back. Special consideration was given to the seamless transition between interaction types, making consistent use of the directional arrows as an interface element, and supporting “highlight states” for items selected in a list via the keypad. From there, industrial design, electrical engineering, and mechanical engineering moved forward with the hardware prototype; and interaction design, electrical engineering, and the software development team moved forward with app development, prototyping, and user testing. The engineering team sourced a pressure sensor that is extremely precise — down to +/-0.00023206038 psi — and that also measures air temperature to help compensate for the difference between outdoor temperature and player’s head temperature due to changes in volume based on the ideal gas law. Validation testing with a simulated, 3D-printed prototype attached to an iPad mini provided valuable feedback about the directional keypad from a group of high school and college coaches. Insights from this research led to the rejiggering of several features and addition of new ones, including a well to store a small amount of lubricant right in the pump. Precision inflation requires a lubricated needle, but many users either forget or ignore this step – having it handy might encourage people to do it. 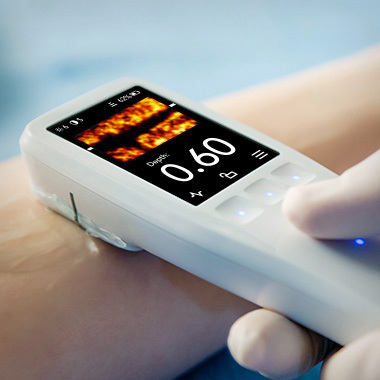 The needle clicks into an impression designed to hold it in place when the cord is wrapped – and the cord is designed to a specific length to help the user achieve this. Along the way, Bresslergroup’s electrical engineers determined a lithium ion battery, similar to what’s used in a Tesla, would be the best way to power the pump. 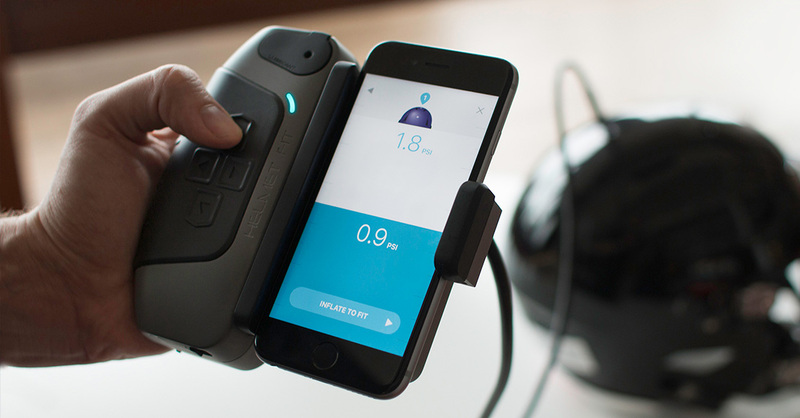 Because the device is so efficient, one charge can handle more than 1,000 helmets, and the pump is chargeable via USB. Bresslergroup created presentation prototypes for trade shows and fully functional alpha prototypes for on-field testing with football teams. Minor refinements can continue to be made until the product is launched in Spring 2018. Weatherby was granted a patent for a “system and method for easily and frequently checking the gas bladder pressure levels in a sports player’s helmet and refilling them to maintain optimum head protection for the player.” Elite programs including Ohio State University and the San Francisco 49ers have signed on with HelmetFit for the 2018 season. Former President & COO of Riddell and former Director of Product Development for Schutt Sports, J.C. Wingo, recently told AFCA (American Football Coaches Association) magazine: “I’ve been in this industry over 35 years, and I think this is something that’s long overdue. 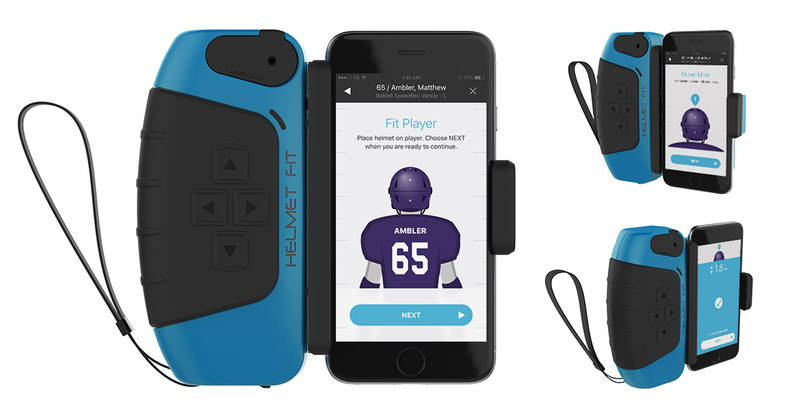 It’s a product that should be in every locker room.” With its novel design and accessible price point, HelmetFit is a solution that could have a major impact on a serious problem.